The FDS simulation that best represents the witnessed fire conditions indicates that the fire that spread throughout the attic and first floor developed a wind driven flow with temperatures in excess of 260 °C (500 °F) between the den and front door. The critical event in this fire was the creation of a wind-driven flow path between the upwind side of the structure and the exit point on the downwind side of the structure, the front door. The flow path was created by the failure of a large span of windows in the den, in the rear of the structure. 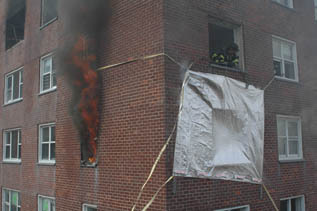 Floor-to-ceiling temperatures rapidly increased in the flow path where multiple crews were performing interior operations. 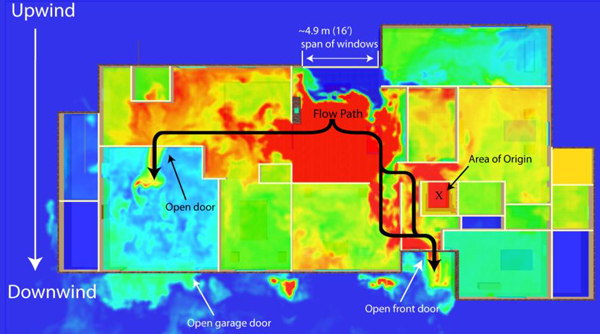 In a simulation that excluded wind, the flow path was not created, and the thermal environment surrounding the location of interior operations was improved. Still image from FDS simulation. Temperatures at 1.5 m (5 ft) above the floor throughout the house 10 s after solarium failure. Image credit: NIST. Click here to see the simulation video. 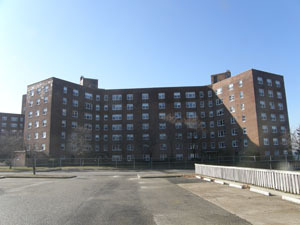 Together with the Fire Department of New York City (FDNY), the Polytechnic Institute of New York University, and with the support of the Department of Homeland Security Federal Emergency Management Agency Assistance to Firefighters Research and Development Grant Program and the United States Fire Administration, our researchers conducted a series of wind-driven fire experiments in a seven-story building on Governors Island, New York, in February 2008. The objective of these experiments was to improve the safety of firefighters and building occupants by developing a better understanding of wind-driven fires and wind-driven firefighting tactics, including structural ventilation and suppression. The experiments evaluated the ability of positive pressure ventilation fans (PPV), wind control devices (WCD), and exterior water application via high rise nozzles (HRN), operated from the floor below to mitigate the hazards of a wind-driven fire in a structure. The building was instrumented to measure temperature, differential pressure, and gas velocity to examine the impact of the PPV fans, WCDs and HRNs. Each of the experiments was documented with video and thermal imaging cameras. These experiments captured video of specific fire phenomena that are not typically observable on the fire ground. These experiments demonstrated the "extreme" thermal conditions that can be generated by a "simple room and contents" fire and how these conditions were extended along a flow path within a real structure when wind and an open vent are present. The thermal conditions generated along the flow path were untenable, even for firefighters in protective gear. Deployed from the floor above the fire, a WCD was shown to be effective in reducing the thermal hazard in the corridor and stairwell. Deployed from the floor below the fire, external water application with a HRN was demonstrated to be effective in reducing the thermal hazard in the corridor and stairwell. FDNY has implemented the use of these tools and tactics throughout the department. Impact of PPV. PPV fans alone could not overcome the effects of a wind driven condition. However when used in conjunction with door control, WCDs, and FBNs the PPV fans were able to maintain tenable and clear conditions in the stairwell. Impact of WCDs. In these experiments, the WCDs reduced the temperatures in the corridor and the stairwell by more than 50 % within 120 seconds of deployment. The WCDs also completely mitigated any velocity due to the external wind. The WCDs were exposed to a variety of extended thermal conditions without failure. Impact of externally applied water. In these experiments, the externally applied water streams were implemented in different ways; a fog stream inserted into the fire room window, a fog stream flowed from the floor below into the fire room window opening, and a solid water stream flowed from the floor below into the fire room window opening. In all cases, the water flows suppressed the fires, thereby causing reductions in temperature in the corridor and the stairwell of at least 50 %. The water flow rates used in these experiments were between 160 gpm and 200 gpm, demonstrating that a relatively small amount of water applied directly to the burn fuels can have a significant impact. These experimental results indicate that the post deployment thermal conditions for flow path control using a WCD, after the development of wind driven conditions, were still of a level which could pose a hazard to firefighters in full PPE. However, when used in combination with PPV fans to force cool air into the stairwell and out through the fire floor, and/or with the cooling effect from an externally applied water stream, the fire floor temperatures can be reduced to near ambient conditions in a matter of minutes. The experiments also provided potential guidance for firefighters as a part of a fire size up and approach to the room of fire origin: note wind conditions in the area of the fire, look for "pulsing flames", or flames not exiting a window opening, examine smoke conditions around closed doors in the potential flow path, and maintain control of doors in the flow path. Even if flames are being forced out of adjacent windows with a high amount of energy, there could still be sufficient energy flows on the fire floor to create a hazard for firefighters. The data from this research will also help to identify fire fighting strategies to improve standard operating guidelines (SOG) for the fire service to enhance firefighter safety, fire ground operations, and use of equipment. If the demonstrated technologies continue to prove effective in the field trials and pilot programs, the next step may be to examine the need for standards and standardized test methods to define a minimum level of acceptable performance of these devices. Click here to download the videos.